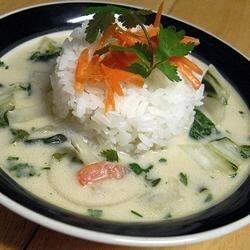 "Fragrant, spicy, and absolutely delicious Thai chicken soup. I've eaten a bit of Thai, and I think this comes very close. Add noodles if you like with the cilantro." In a large saucepan over medium heat, heat peanut oil. Stir in garlic, ginger, lemon grass, red pepper, coriander and cumin and cook until fragrant, 2 minutes. Stir in chicken and onion and cook, stirring, until chicken is white and onion is translucent, 5 minutes. Stir in bok choy and cook until it begins to wilt, 5 to 10 minutes. Stir in water, coconut milk, fish sauce and cilantro. Simmer until chicken is thoroughly cooked and flavors are well blended, 30 minutes.